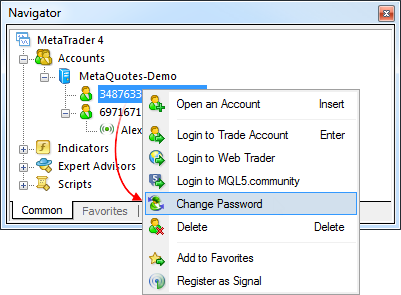 Fixed changing a password for an inactive (unconnected) account. Optimized use and release of memory when working with large amounts of historical data. Fixed and optimized working with a large number of news categories. 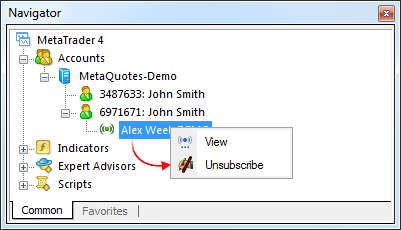 Fixed unsubscribing from signals via the Navigator window context menu. #property copyright "Copyright 2015, MetaQuotes Software Corp."
Fixed memory reallocation in the ArrayCopy function that could occasionally cause crashes of MQL4 programs. Fixed an error that occasionally caused nulling of the variables declared on the global level after testing an indicator. Fixed testing when connection to a trade server is lost. Fixed defining a function name in MetaAssist in the presence of type casting. Added F hotkey to call the search function from the Code Base tab, as well as multiple tips in the status bar for the commands for working with a code: increasing/decreasing indentation, navigation, case shift, etc.